BuckleUpforLife.org provides car seat information and safety resources. This Go-and-Grow Air Car Seat from Safety 1st makes travel so much easier. 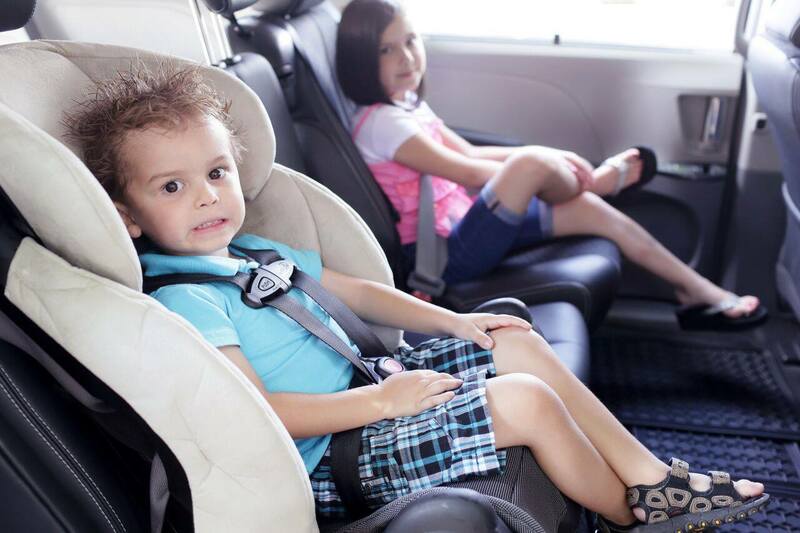 When Child Passenger Safety Week rolls around each September, auto companies and non-profits promote national campaigns to increase safety awareness of car seats and boosters. However, parents know that child safety — whether in a car, train, taxi, airplane or other moving vehicle — is a year round concern. And with the technology and innovation that’s gone into all aspects of parenting, it’s time for a refresher on safety recommendations for transporting our tiniest travelers. “Keep your child rear facing as long as possible,” says Ryan Hawker, Safety 1st Child Passenger Safety Technician and the company’s car seat safety expert. We know how busy moms hate this idea, but Safety 1st and other companies offer inexpensive, shatter-proof mirrors that enable new parents to monitor their infants from the front seat, as well as soft toys that keep older infants busy even without a view. The message: don’t rush to reverse the direction of your car seat. Ryan cites a study in the Journal of Injury Prevention which found that children under the age of 2 are 75% less likely to die or be severely injured in the event of a car crash if they are facing to the rear. Before securing a child in any safety seat, remove bulky outerwear such as a rain jacket or winter coat. A coat can prevent the harness from fitting correctly, or compress in a crash, compromising the seat’s ability to protect your child. Are grandma and grandpa saving your old car seat for when their newest great grandchild comes to visit? Not a good idea. Ryan Hawker warns that car seat plastic can become brittle, and worn fabrics and straps may not do their job well. Car seats literally do “expire” and parents should check the expiration date on the back or the side of the car seat before using one. Additionally, just as with a bicyle helmet, if a car seat has been in a crash, do not use it. While car seat use is mandatory for infants and toddlers, fewer parents take advantage of booster seats recommended for children who are out of car seats, but not yet big enough to safely wear seat belts. They are valuable safety tools also. Standard belts do not ride low on the hips of a child who slides forward, or fit snugly across a short child’s chest. Therefore, experts say children who have outgrown child safety seats should use booster seats until they are at least 8 years or 57″ tall. According to national statistics, fewer than 20% of children ages 4-8 (about 40-80 lbs) do use them on a regular basis, yet it’s estimated that 45% of serious car-related injuries could be prevented by their use. Fortunately, innovative thinking has extended to the booster seat market and it may well inspire more families to use them. A new product going on the market in Spring 2016 is mifold, a super compact and portable child car safety seat which works by bringing the seat belts down to the child’s smaller torso size. Even better for travelers, it is 10 times smaller than a regular booster seat and can fold into a glove compartment or tote bag. Invented by a dad of four and funded through a Kickstarter campaign, we hope it has a successful launch. Note that at this time, it is not certified by the FAA for airplane use. Buying a child safety seat means knowing how to install it. The universal LATCH (Lower Anchors and Tethers for Children) system has standardized carseat and booster installation in most vehicles. LATCH systems, which make it easier for parents to correctly attach a LATCH carseat to anchors built into the back seat rather than with seat belts, is mandatory on two rear seats of all vehicles, and on convertible carseats and toddler/booster seats. Never use both a seat belt and a LATCH device to install a car seat or booster. Never heard of LATCH? Never fear. There is a lot of information available about LATCH and how to schedule a free car seat installation inspection when you try it out. These inspections can be done at many AAA offices, police and fire stations, and even community centers, so check the websites SaferCar, SeatCheck and SafeKids for information on the nearest location. Here’s a video with more safety tips. Your carseat can do double-duty when you fly with babies and toddlers. While carseats certified for use by the FAA remain the most effective restraint for children occupying their own airplane seats, however, neither the LATCH system nor booster seats (backless seats can crumple forward on impact) will provide enhanced safety during flight. Fortunately, the FAA has published a Child Safety Seats on Airplanes brochure so that parents will be fully informed about their choices. For more information, try www.nhtsa.dot.gov. Today, there is consensus that parents who can afford to purchase an airline seat should, and that infants should be properly restrained. Prefer not to travel with your child’s car seat or booster? Not a problem. Fortunately, innovation has made restraining a child in flight easier than ever and there are many easy-to-carry tools to do so. Another option for parents is the lightweight, foldable Baby B’Air Infant Vest, which parents can tuck into their bags and use, like a fortified bib, to contain squirmy toddlers and strap them into an airplane seat. Both are convenient alternatives to FAA-certified car seats (which were never designed to be lightweight for air travel), and can be a smart investment for frequent traveling families, because they offer greater protection for young ones than a parent’s lap. Before you plan your next road trip or flight with babies and toddlers, make sure you’re informed and up to date on the latest safety seat recommendations.